Itzulia Basque Country, or Vuelta al Pais Vasco or Euskal Herriko Itzulia, as the race was known back in the days, is an event with a long history and a big fan favorite. On the race's palmares, we can find illustrious names such as Gino Bartali, Jacques Anquetil, Sean Kelly and Tony Rominger. The record for most wins is held by two Spaniards, José Antonio Gonzalez and Alberto Contador, with 4 wins each. For the inaugural edition, we have to go all the way back to 1924, when Parisian Francis Pellisier claimed the victory, which in fact means this race is an entire decade older than the Vuelta a España. After a 33-year hiatus the event returned in 1969 and was held each year until present day. Last year the organizers decided to try out a new formula, positioning the race's time trial in the middle of the race, instead of in its traditional spot as the final showdown. This year, they went even further and placed it right at the very start. It'll be interesting to see the effect on the eventual outcome! The I.T.T. is a classic Basque Country time trial, only a little shorter than usual, but with a significant hill on the course. The Antioko Ermita is short but don't underestimate it, after some false flat km the riders will face 2.2 km at an average of 9.5%, with the last 800 meters spiking up towards 15%. It'll be of great importance to keep a steady pace and avoid a breakdown on this section as you could easily bleed lots of time. An interesting stage, while not very difficult on paper (if we ignore the exaggeratedly spiky profile), which could create some chaos. There will be several unpaved sections, about 5 km in total, and while this isn't expected to influence the race a great deal, watch out for flat tires at inopportune moments. The riders with GC hopes will have to remain alert throughout the stage and especially on the run-in towards the line, as a tricky final km awaits them. The last km averages 5% but the final 500 meters kick up even more. Not a stage for the regular sprinters. Stage 3 looks very similar to the previous one. While there are no unpaved sections, hilly terrain and an uphill kick towards the line define this stage. The finale is more of an uphill drag than on the previous stage, with the final 2 km averaging about 4%. It's probably too easy to provide much of a challenge for the GC climbers, but we could see a good mix of puncheurs and semi-sprinters in the battle for the victory. Another interesting stage on the menu. The 1st category Bikotz Gane climb (5 km at 8.5%) could already generate a selection, but at 35 km from the line is unlikely to be decisive in either the GC battle or the battle for the stage victory. In the final 10 km the race should explode, though. Don't be fooled by the stats for the final climb (3 km at 3.5 %) because as anyone with functioning eyes can see, the climb is made up of two sections, divided by a short downhill stretch. The first section of the climb should be about 1 km at 6.5%, while the second section looks a little tougher, with the first 500 meters at about 10%. The final 500 meters get a bit easier, and after the summit a short descent into Arrigorriaga follows. The downhill doesn't look too tricky, with wide roads and good tarmac, so expect a rapid descent. Any rider that gets to the top of the climb with a small gap should have a good chance to stay ahead all the way towards the finish. Itzulia wouldn't be Itzulia without the traditional Arrate stage, so here it is. The finale starts with the climb to Izua, which takes the Matsaria road from Eibar, infamous for it's double-digit percentages. Afterwards, the peloton faces the easier Trabakua climb, 4 km at 6%. Then, after a few km of up-and-down terrain, the riders will reach the foot of the Usartza climb. They will approach Arrate from the traditional side, with the short descent towards the finish. The race finishes with a short but difficult stage around Eibar. The first part of the stage isn't too difficult, but after about 45 km the peloton will reach the first challenging climb of the day, Azurki (8 km at 6.7%). Shortly after, Karakate is on the menu. 5.5 km long at 8.7%, it is the steepest of today's climbs. 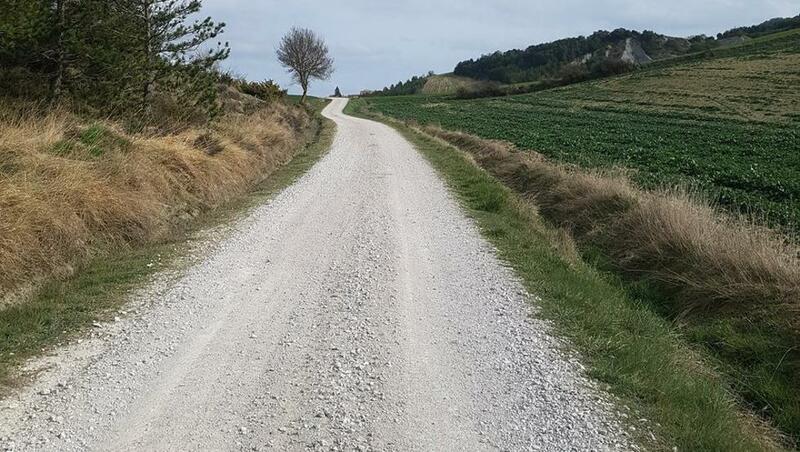 The road is quite narrow so positioning before the climb will be crucial, as well as before the descent. The last climb of the day is Asentzio (3.5 km at 7.8%), followed by a short descent and another small uphill stretch towards Karabieta. The descent is pretty straightforward with very few corners and wide roads, but mind the little uphill spike at about 4 km from the finish. It could be a perfect launching pad in case there are still multiple riders in the group fighting for the stage victory. The race will approach Azurki from a different starting point, so the first part of the climb will be different, but the profile from Ugarte Berri on is the same. to be fair, apparently Jumbo has some problems with the gearing, it's not the first time that this happened. Split times were not realesed unfortunately, but Daniel Martinez was awarded with the mountain jersey, so apparently he was the quickest on the climb (although bike changes influenced the times of course). some teams did a recon, and apparently the surface itself is not as rough as in the north, but this could change in the rain today, and some roads (and especially entries into the sterrato) are very narrow, and with muros in between the gravel sections. Overall this should be enough to make a major selection, I'd think. edit: according to Strava the finish itself is 600m at 8% then. Not sure how accurate that is though. Those sterrato's weren't so bad under the nice weather conditions of the day. Not very dusty either. Only a Yates managed to blow a hole in his tire in the finale, and lost precious time. Apart from that, a tougher stage profile than expected, the on-screen km counter was off all the time and Astana put in a lot of effort in riding hard to no avail, because Alaphilippe has a better finish. In other words these are the not-news that confirms it is all business as usual in the Pays Basque. I've just watched today's stage. A major crash in the finishing kms took out a bunch of big names, mostly among Deceuninck - Quick Step and Sky. A DQS rider was the first man down which took out Mas and Alaphillipe, who looked quite seriously injured and did not re-mount. Could mean a spell off the bike for the Frenchman; his classics campaign now in question. I think Castroviejo (because of his injuries) must have been the Sky rider directly behind, who flew over his bike and I think Geraint Thomas (lost 5 minutes) went off into the ditch. Elissonde finished over 9 minutes back with Kwiatkowski, who didn't look good either. He's not yet appeared in the results. Another dozen riders still missing. Edit: Alaphillipe was last to finish , he lost over 11 minutes. yeah, not good to see. Massive showing from Schachmann again though. Sure, Alaphilippe and Kwiatkowski were out of it and with Bevin another contender abandoned, but he really took that uphill sprint with ease then. hard to say what to make of the gc fight now. Also Martinez lost a bit of time due to the crash. could very well be a stage for a breakaway though, especially now with all the teams licking their wounds. Eccch. I hate news like that. I may get to watch the stage on re-run. But what's up with Schachmann? From zero to hero in 60 seconds? Or was he actually on somebody's radar before this? Wowser! He looked like a decent rider when he won a mountain stage in the Giro last year, so it is not a total surprise that he's riding well the year after that. With Quickstep (last year) he was one of a howlin pack of wolves so he got his chances, but not many of them. With Bora he is a captain, riding with some support in many races, plus he is one year older: this cannot be surprise? he also wasn't too far off from winning the Fleche Wallonne with an early attack last year - which hasn't happened for ages - first dropping Nibali, then Haig, and still finished 8th after being caught on the mur. I still didn't really expect him to win the sprint today, but I'd agree that in general his performance this week isn't a major surprise either. Strong in the time trial (2 time silver medallist in the U23 World Championships), good on the hills, decent kick... so be basically brings everything it takes. He looked like a decent rider when he won a mountain stage in the Giro last year, so it is not a total surprise that he's riding well the year after that. With Quickstep (last year) he was one of a howlin pack of wolves so he got his chances, but not many of them. With #bore Bora he is a captain, riding with some support in many races, plus he is one year older: this cannot be surprise? Ok, you guys have a better memory for the lesser known names than I do! I sure don't remember the Giro victory! Ditto the Fleche. Glad I have you folks around to keep me up to speed! By the way, isn´t it almost tradition by now that Alaphilippe crashes in the Itzulia? Does this reveal something about his mental preparedness for this race? He is there, he is strong, but he is not always «on»? I see your Alaphillipe and raise you Steve Cummings. Stage 3 yesterday, he broke his collarbone. Stage 4, 2017, he broke his collarbone. You'd think he'll have learned his lesson and give this race a wide berth in the future! It's in Basque of course, but google translator does the job. About the big climb with ~40k to go he says "in the race, it will be climbed in 13-14 minutes. At 16 kilometers per hour, something like that. It is difficult for a team to go to the limit on Bikoitz Gane with the intention of going for the race. It can be used to harden the race, it can be used to position itself, to be well placed and try to avoid mistakes, - but not to leave contenders behind, I think. The descent is not dangerous either. It's fast. It has some dark spots, but you just have to touch the brake. In case it rains if it can be dangerous though. In the race the speed will approach 100 kilometers per hour, I guess. More than 90 kilometers per hour for sure." And about the finish: "It's going to be insane. I have calculated that it'll be two efforts of three minutes each. Three minutes for the first part of the climb. Then comes a quick descent and then there are another three minutes left for the second part of the climb. All at maximum effort. It's practically going to be a sprint up there. [...] [The] descent [is] fast and on a very well paved and wide roads [...] but it is clear that for anyone who attacks and gets ten meters over the top, this can very well be enough to reach the finish line and win." Next year will be the tenth anniversary of the first of Samuel Sanchez's hat-trick of victories on the climb to Eibar/Arrate, wouldn't that be the perfect occasion to re-name the ascent the 'Alto Samuel Sanchez' ? I think so. Is his doping violation still valid or did it go away?